On 20 October 1576 Jan van der Meulen, or Jean du Moulin (1549-1576), a merchant of Antwerp, writes to his brother and trading partner Andries van der Meulen in Cologne. He informs him about his safe arrival in Antwerp after an eventful journey during which he has been waylaid by marauding Spanish mutineers. Spanish troops are also quartered in the citadel of the city. Regularly they open fire on the city, for example when ships loaded with fish or other foodstuffs enter the port. There are casualties. Two weeks later, on 3 November, Jan writes to his brother again. Peasants from the neighbouring villages are now taking refuge behind the city walls with their cattle and carts loaded with furniture. Citizens store water supplies in their warehouses to extinguish fires. While writing this letter he learns that the gates are being opened for auxiliary troops from the States General. There is tension in the air, but Jan does not appear to be in panic. One day later the mutinous soldiers march from the citadel into the city and four days afterwards Andries van der Meulen notes on the reverse of the last letter: ‘received 7 November 1576 when the Spanish Fury took place’. 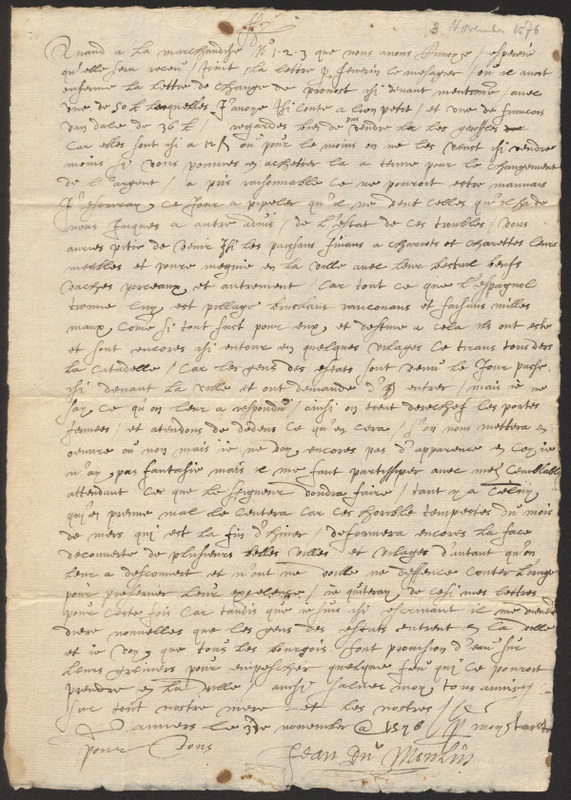 At that time Andries must still have been ignorant about the fate of his brother Jan. A letter to him from his friend Henrick de Hazen from Antwerp, dated 11 November and received five days later, cannot have reassured him. It is an emotional account of the ‘destruction and misery and wretchedness’ that the mutineers have caused: ‘the cries and lamentations of the people are so loud that one’s heart grieves’. To his regret Henrick has received no information about Jan van der Meulen ‘We hope that he has gone over the city walls or embarked on one of the ships to Zealand’. Afterwards it becomes clear to the family that this is an idle hope: Jan van der Meulen has perished during the Spanish Fury. From 4 till 7 November 1576 the city of Antwerp, at that time the most important seaport in Northern Europe, was pillaged by 5,000 Spanish and German soldiers from the army sent by the Spanish king Philip II to crush the uprising in the Low Countries. The Spanish treasury was empty and for a long time the soldiers had received no pay. As a result of the mutiny 7,000 citizens died. Hundreds of houses were destroyed by fire, among which the recently built Town Hall, Antwerp’s wonder of the world. The Spanish Fury became a symbol of the Spanish tyranny in the Low Countries. It was one of the reasons for the Northern and Southern provinces, Protestant as well as Roman Catholic, to close ranks. The negotiations for a treaty between the Seventeen Provinces were concluded much earlier than expected and on 8 November, one day after the Spanish Fury, the Pacification of Ghent was signed. These letters are part of the archives of the Bibliotheca Thysiana in Leiden. These archives contain more than a hundred account books and more than a thousand business and family letters of several Calvinist merchant families such as Thijs, De Baccher, l’Empereur and Van der Meulen, who in the last decades of the sixteenth century emigrated from the Southern Netherlands to the German states and subsequently to the Dutch Republic (Amsterdam, Utrecht and Leiden).